Time sure flies, especially in the month of February; it’s almost OVER? Didn’t it just start? So this month’s Progressive Eats event is upon us a bit earlier than normal but I’m thinking it’s perfect timing. Except for the heartless person bragging today about living in ‘SoCal’ because they are not dealing with snow, most of us are in the middle of winter. Snow, sleet, ice, windchill; words we are hearing too often. Freezing cold and too much snow are wrecking havoc out East and I feel lucky we’ve only just received 8 inches of snow, but still, it’s winter, it’s cold and it’s time to say Soup’s On! This months’ event is being hosted by Lauren Keating from the blog Healthy. Delicious. My contribution to this event is healthy because Chicken Soup is magical. Seriously. OK, maybe that’s a bit of an overstatement but it has been proven to have positive health benefits; my version is chock full of veggies and that it tastes so warm and satisfying is why I think it’s so good for you! Without a doubt my favorite soup and I know this for a fact; it is certainly delicious! My grandmother first made this soup and then my mother before me and I’ve been cooking it for years. I’ve made some slight variations of my own; the peas, mushrooms, white wine and balsamic vinegar are ingredients I thought could only elevate a fabulous soup with a layering of additional flavors. The decision to brown the chicken is a good one but still, it’s just a modification of what has always been an old and comforting favorite. Sick? This is my tried and true dish for friends that are under the weather; I have a feeling some will even fake a cold if it means I pull out the stockpot and make chicken and dumplings for them! Though I typically make this soup using freshly purchased chicken, it’s also a great way to use leftover turkey from Thanksgiving; either prepare the soup and include chopped up pieces from your leftovers or put some bone in pieces into the stock and cook long enough for the meat to fall off the bone. Believe me, turkey and dumpling soup is equally delicious! I’ll use a whole chicken, cut up parts or this time around, boneless thighs. Have to tell you; I loved them. SO easy once it was done to just pull the meat apart and not deal with bones. It is definitely my new favorite! True confession? I use Bisquick for the dumplings. It is the only reason I buy it. Sure, I could make my own biscuit mix but Bisquick has never failed me and the truth is I hesitate to try anything else for fear I won’t like them and will have used some of my precious soup for a trial that did not work. If you have a great recipe; please leave it in the comments; I might try something that comes highly recommended! I like dumplings that are light and fluffy and just absorb a bit of the surrounding soup. Umm um, good! The hardest part of making soup for the blog is taking the time to write down ingredients; I doubt I make it the same each time, but this time I paid attention and the result was outstanding so I think we’re good to go. Another thing I do that my Grandma did not. I make the soup using chicken stock, not water. 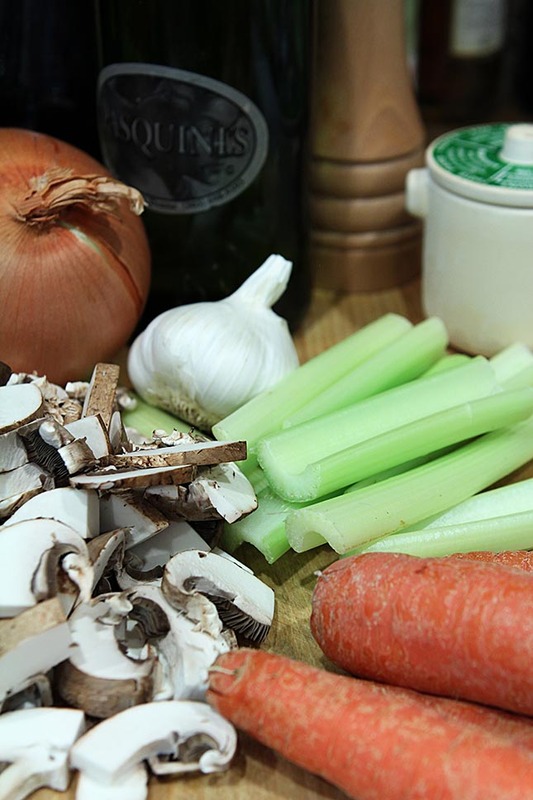 If made with water I’ve simply made stock…so if serving as soup it needs to be richer so the addition of stock to the mix makes a huge difference. Try it, you’ll see! Handed down from my grandmother through generations; this is our favorite soup. Mix ingredients for seasoned flour and put into a shallow dish or plate, holding aside 1/4 cup of mixture. Add butter and olive oil to pot and heat on medium until sizzling. Make sure chicken has been patted dry; put into seasoned flour mixture and put pieces into pot; do not crowd. Saute a couple of minutes on each side until lightly browned. Remove all pieces and put onto plate. We're just browning, not thoroughly cooking the chicken. Add onion, carrots, celery and garlic to pot and saute lightly for about 5-7 minutes until onion is translucent. Add mushrooms and saute just until they start to wilt. Return chicken to pot and add chicken stock, white wine, balsamic vinegar, salt, pepper, rosemary, thyme, paprika and bay leaves to pot; if necessary, add enough water to cover all ingredients and bring to simmer. Cover and cook on low heat for approximately 60 minutes til meat is tender and/or falling off of bone if using chicken parts.. Remove the chicken from the stock and allow to cool. Once cool, remove skin and bones if necessary and pull meat into bite size pieces and return chicken to pot. Taste soup and correct seasonings if necessary. Add reserved seasoned flour to half and half and add mixture to soup. Bring to a boil to thicken. Mix baking mix and milk just until soft dough forms. Drop by spoonfuls onto boiling soup, reduce heat. Cook uncovered 10 minutes, Cover and cook additional 10 minutes. Remove dumplings to a serving platter and cover with foil to keep warm. Add peas if using to soup stock. 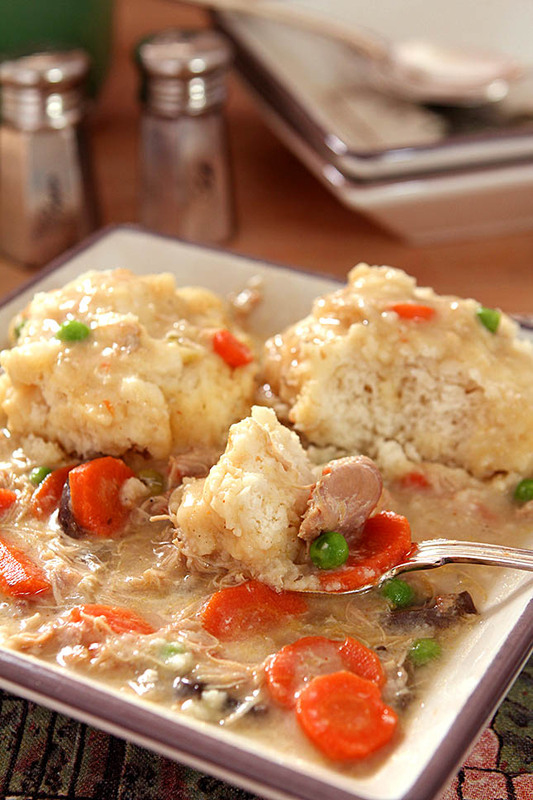 Allow soup to cool for approximately 5 minutes and serve in bowls with dumplings. I've always used Bisquick for the dumplings...guess it's a family tradition. It's a combination of flour, leavening and shortening but you can use any recipe you have for dumplings. Soups On! Visit some of my friends for more fabulous dishes for a dinner focused on soup. Very delicious!!! may be i should try this out today or tomorrow. Hey, I had this soup when i was in Tel Aviv. May be its famous there. Simply i loved it. The soup that you just described is Mata Ball Soup, the “dumplings” being mata balls. It is a Jewish soup. Big confession #1: I love Bisquick and always have it on hand. I’ve cooked with it for decades. Big confession #2: I’ve never made dumplings. Your soup looks amazing – I need, really need, to make it. And I’m pulling out my Bisquick! Me too me too! I use it for two things. Dumplings and biscuits for strawberry shortcake. And it’s always so good I’ve never been inclined to make it harder (ie find a similar recipe from scratch). So would you make a veggie version or take this opportunity to wimp out and have a bit of chicken? I’ve always used Bisquick too. But a secret that was shared with me from an 80 something friend many moons ago was to make the dumpling dough and let it rest in the bowl about 20 minutes to let it start its rising process. Makes the lightest fluffiest dumplings you have ever tasted. It doesn’t get any more comforting than chicken soup, and on a snowy night like this one I sure hope you have leftovers to enjoy! I haven’t had this dish in years! And it’s a good one. Who doesn’t love dumplings? When it comes to drop dumplings, I usually use the recipe from The Joy of Cooking. It’s timeless, and it works. Sometimes I add an extra egg for richness. Anyway, good stuff! Perfect for the weather we’re having. I haven’t had chicken and dumplings in forever! Love the idea of it in soup form – so warm and comfy. I can just barely call this a soup I like to stuff it with so much goodness Jeanette; but it still is and yes, it is exactly that. My mother always made dumplings with her chicken soup. I never make dumplings, never been good at getting them just right. You certainly have mastered them and the soup. More than anything else, this is the meal that takes me back to my childhood and cooking with my grandmother. Thanks for the beautiful soup, luscious recipe, and a walk down memory lane for me Barb! Me too Jane…I was serious, it’s all about family and of course friends who know this is what is coming if they are under the weather. It’s magical I tell ya! In my book, this is comfort food at its finest. I love the ease of boneless chicken thighs, too. I’m so happy that you took the time to finagle all the ingredients into a recipe to share with us. Now, pass me a big bowl, please! I have always loved dark chicken meat but I used breasts for years because of the ease of boneless. SO happy to be able to get boneless thighs now. Not so happy with how pricey they are but obviously I’ll pay for that convenience! Wish I could share, trust me. I didn’t have a good chicken soup with dumplings recipe. Now I do. I can make these a tradition and when my daughter grows up she san say “this is my aunt Barb’s recipe”! That girl loves your food ! 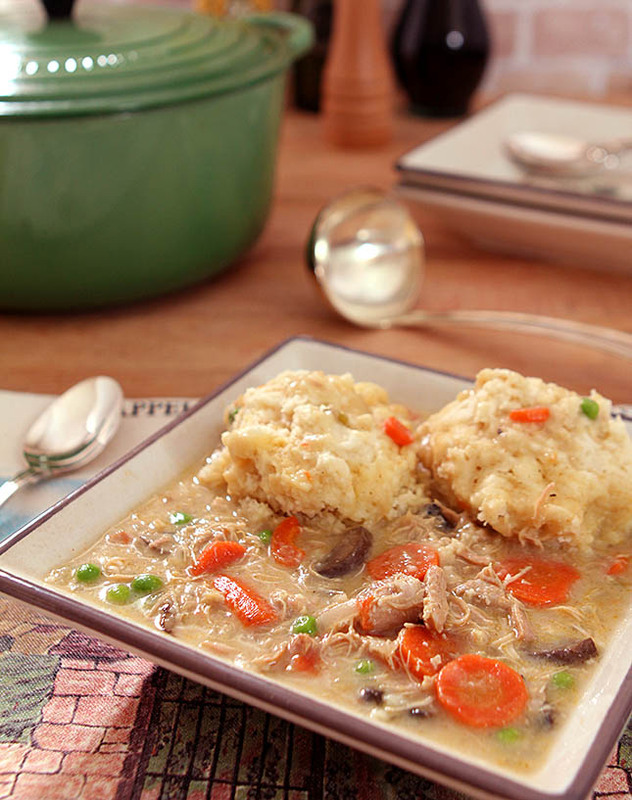 Chicken and dumplings is one of my all-time favorites. My mom makes an amazing pot of dumplings and I don’t think mine ever turn out quite as good as hers. 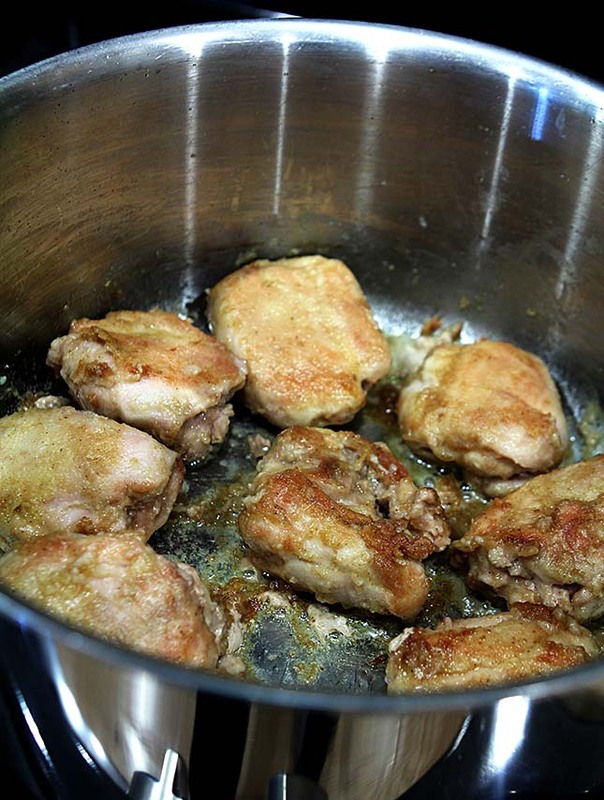 I love that you brown the chicken thighs, totally brilliant for that added flavor. So glad you shared this incredible recipe for this month’s Progressive Eats Dinner! We always have a box of Bisquick for when Bill makes his weekend breakfasts. Love how fluffy your dumplings look and how comforting this soup must be. Cough, cough…do you deliver to Indiana?? They turn out SO well I just can’t make the shift to anything else. BUT I did just do a pancake recipe that is made in the blender Liz that maybe Bill should try. Beats convention for sure because it’s so easy but also beats Bisquick by a mile! Thank you Samantha; I guess in another world it might even be called a chicken stew…but never was in mine. It is my all time favorite and a few degrees cooler here in Denver and it will be on the table stat! This is what I always cooked for my children when sick too…or take to a neighbor when they get a cold or the flu. Maybe it’s the nutrients but I just like to think it has some magic! Awesome recipe….looks so gorgeous. Have bookmarked it. Thx lots for recipe!